Since 2008, upon the release of the first Polaris RZR S, Concept Distributing has been building, testing and tuning with UTV / Side-by-Side vehicles to make them safer, stronger and more capable than ever before. Concept Distributing is a one of a kind Canadian company. 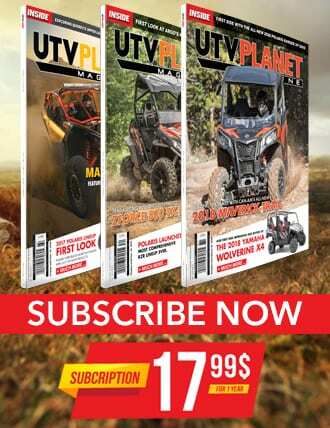 We manufacture, retail and distribute performance UTV parts. If a part doesn’t meet our testing standards, we don’t sell it. Our business is dedicated to finding out which products are the best so our customers don’t have to. We deal with only the most reputable companies and everything we build in house is tested thoroughly before it ever makes our showroom floor. This relatively new sport of four-wheeled fun has been an easy transition from our background in racing and freestyle motocross. The capabilities of these machines are mind-blowing while still keeping the occupants safe with roll cages and harnesses. 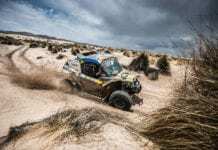 Concept Distributing lives and breathes the UTV race scene and is constantly pushing to get Canadian racing to the next level. Keeping everyone safe on and off the track while offering an extreme racing experience for all levels of riders is a positive future we see for Canada. Testing Concept’s products at the track is a great way to show our customers our quality control at work! With Concept’s race team winning a staggering number of races, countless podium finishes and multiple season championships there’s no denying our legitimacy. But what else can we do to show that we go above and beyond? How about watching team leader Al McBeth #357 take one of our custom built Polaris RZR S to the next level by breaking a world record with it!! 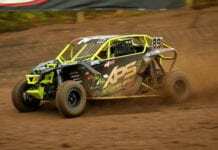 Al’s personal race car this year is a heavily modified 2015 Polaris RZR XP 1000. Cage/doors/chassis, roof, nerf bars, radius rods, bumpers and billet grill all built by Concept Distributing, full HOLZ Racing Suspension set up with custom valved WALKER EVANS 2.5” shocks on all 4 corners. METHOD Race Wheels, TWISTED STITCH suspension seats, MUZZY EXHAUST, CBR Radiator, RHINO Axles, DRAGONFIRE Seat Bases and Fuel Controller and a benchmark ECM Reflash just to name off some of the upgrades. This vehicle was built to be strong, safe, and win races as well as to take a run at the UTV distance world record! Al’s love for jumping and experience in the air made him the preferred candidate to tackle the record jump. This all began up at Concept Distributing’s test facility up in the mountains of Abbotsford BC. Canada. Starting out as a simple dirt track, the facility has grown to one of the most extreme side-by-side test locations in the world. Multiple ramps and dirt jumps of every size and angle will push any machine to the limits and keep drivers on their “a” game. 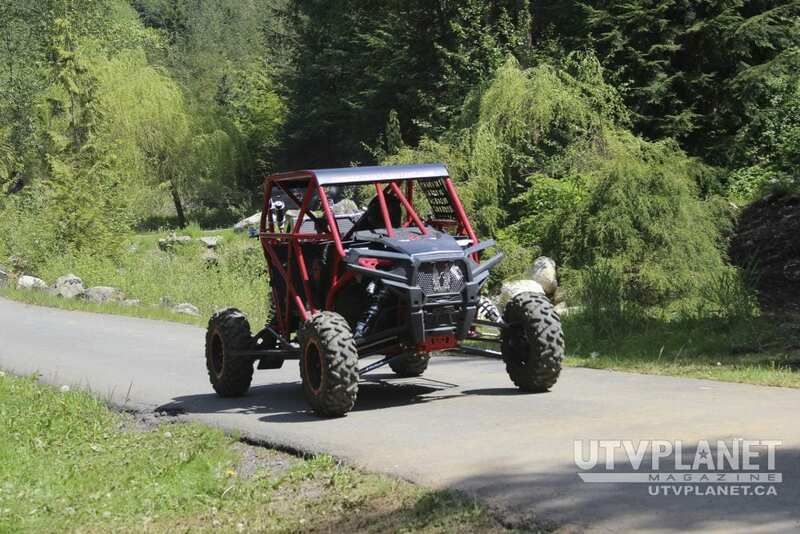 As the UTVs become more capable, the test grounds become more extreme… and what a great way to test Concept’s products! So when we designed the setting for the record jump, once again things had to change. It took over 4 months of patiently awaiting BC’s scattered weather to permit enough workdays to get the job done. Gathering resources, chopping trees and moving a lot of dirt could not have been done without the overwhelming support of Concept’s family and friends! The first day of testing went smooth until a small miss calculation had Al’s rear wheels catch the edge of the landings safety deck almost flipping him end over end! The impact ended up breaking the engine’s oil pan and the day was done. The next weekend, back with a new pan and some upgraded HOLZ Racing engine mounts, Concept Distributing’s custom built Polaris RZR XP1000 sailed over the ramp to touch down at 181 feet breaking the UTV distance world record! But the goal was 200 feet, so we continued on. The ramp was now at a 130 foot gap and the run-in was turning into more of an “s” curve then a direct shot to the take off. The shocks were starting to bottom out hard and the engine was beginning to bounce off the rev limiter on take off. So once again back to the drawing board. A new run-in was built, the landing was extended, shocks were completely redone and the clutch was tuned accordingly. The following weekend the stage was set. After a brief warm up and the vehicle once over on some test runs, Al held his foot to the floor and launched the Polaris RZR to touch down at 198 feet surpassing the UTV distance record he had just set the week before! Due to the shape of the property and the massive area needed to perform a jump of this size, the run-in to the take off ramp had been less than ideal from the start. As the ramp got moved further back, there was now less than a 250 foot run-in after a sharp 90 degree turn from the road. The Polaris RZR, still running a stock engine with only an upgraded exhaust system, tuner and ECM reflash was now maxing out for speed on the short run-in, and the landings were becoming dangerously close to flat. Ecstatic about now having the record, but disappointed on not reaching the 200 ft. goal, the realization that we had now outgrown our facility was on us. 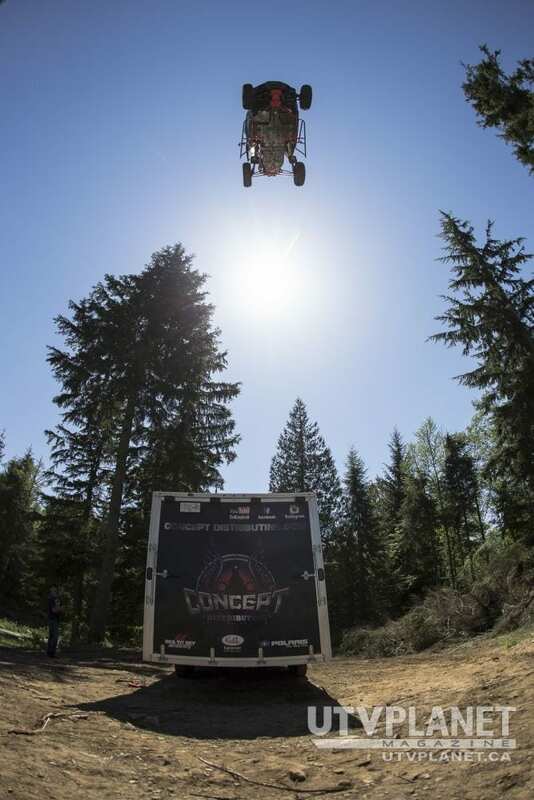 Al got back into his RZR, headed to the launch area and proceeded to consecutively hit 7 more 180 foot jumps. The professional camera crew that had come to document the event was thrilled with the opportunity and pounced on capturing every angle in awesome HD footage from helicopters, drone cams, ground crews and on-board cameras. Not 24 hours had passed before AL was on route to check out a new, bigger jump location. The support Concept has received, the feedback we have got and friends we have made surrounding the making of this jump has been mind blowing. 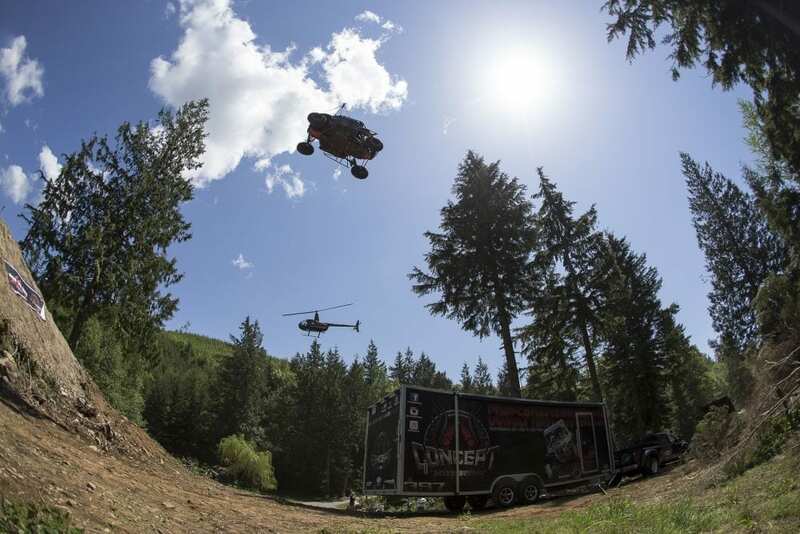 Concept Distributing will continue to push the limits of the UTV world to the next level. A new location is already locked down and goals have been set for Concept’s next ground breaking event. To describe it as bigger and better is an understatement. We’re just getting started! Concept Distributing would like to thank everyone involved for all their support. Without them, none of this would have happened. Concept would like to give a special thanks to Holz Racing Products, Polaris, Sea to Sky Motorsports, Alder Steel, “famous” J Puddifant, Jay Poole, Tom Kettering, Mitch Crone and Mennan Landscaping. We would also like to thank Jeremy Deichen from Loaded Gun Productions, Brad Freisen and crew – Josh Knepper, Levi Allen, Al Dupuis – One Eye Productions, Anastasia and Mark-Sugarshark Productions, Mason Mashon and Cody McNolty for helping capture this event!